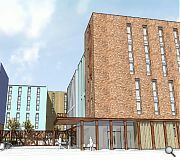 Balfour Beatty and Oberlanders Architects have submitted plans for a mixed use development comprising retail and student accommodation on Kennedy Street, Glasgow. Situated in Townhead, a light industrial area to the north of the city centre, the site is earmarked for 525 bedspaces arranged around a landscaped courtyard. In their design statement Oberlanders noted: “The proposed development form sees a four storey streetscape along the majority of Kennedy Street. A strong linear retail frontage sits beneath three storeys of residential accommodation. An elevated end-stop defines the courtyard entrance. “Along North Wallace Street, building heights drop to a two storey ‘mews scale’ reinforcing the hierarchy of street and side street. To the rear, development remains within six storeys. Finalised colour schemes and brick specifications have yet to be decided upon. Another bland scheme from Oberlanders. Can these guys design without 90 degree corners and the 'old hat' corner window? Methinks not!! Courtyard depressing. I will leave further critique to Big Chantelle. "Finalised colour schemes and brick specification have yet to be decided upon", thank heavens! If you are going for a 1980's former industrial site in the Netherlands aesthetic then really go for it, ditch the 'jolly' render and do it all in brick. If we were looking at a prison here, it could be argued that a justifiable criticism could be made against these proposals as being too 'austere', or even 'inhuman'. And, if i am to take a different viewpoint much further, i dont think i'd be too controversial in asking, why are students considered as untermensch? 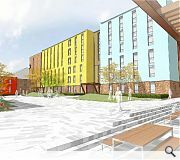 So, when i square this proposal with the work of Richard MacCormac, in terms of student accommodation, it really is shocking to stand back and see how 'low' a neo-liberal economic agenda has taken us. This is shocking, really. And we the architects just implement it. - just follow orders. - Well hacked off and disgusted, Tunbridge Wells. A game of two halves clearly here. Outside looks great (albeit as ever reliant on quality of brickwork). But why play the obvious (and sensible) brickwork card on the outside only to go all render horendour on the inside? Ugly at best, I can imagine what it will look like after 10 years of fine Scottish weather. "Intended to evoke 'the colour, heat and intensity' of a foundry." Surely this is a joke? Apart from the humour, as said above, this looks like a prison. How will it look in 10 years time? 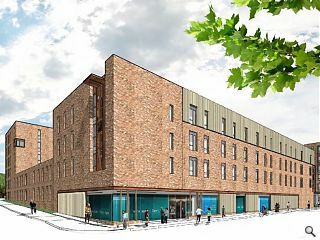 Just look at the student accommodation building across the road. Buff bricks look fine. The render has weathered terribly.Does anybody know of a good looking render building in the West of Scotland more than 5 years old? I don't think so! @beautiful buildings - most of the west coast/island harbours? problem is the context, the detailing and product choice not render per se - the timber is probably going to be the least attractive thing in 10 years time! Having been involved in buildings for over 30 years I have seen every fad that architects have been through. The disasters of render in the 1980's the stone & cast stone of the 1990's and the timber finishes of the last 10 years. There is no doubt that a quality clay brick has the longest life span when you consider the appearance of the building. I would disagree with baby wan in that I think it only takes 2 to 3 years for a timber clad building to lose its appearance. To be fair to the architect the main brief from the contractor will be to design a buildings that is "value engineered" Aka cheap!